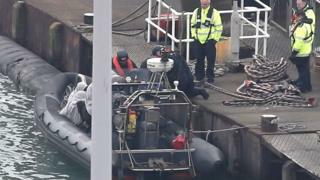 Eight people have been detained after two boats carrying suspected migrants reached the Kent coast on Friday. A Border Force cutter was deployed at about 06:00 GMT and located a rigid-hulled inflatable boat (RHIB) in St Margaret's Bay, Dover. The force sent staff to the area and said one person was detained. At about 07:30 GMT another small boat with seven people on board was discovered heading towards Dungeness. A cutter and a coastal patrol vessel were deployed and intercepted the second RHIB. Border Force said the group, whose nationalities had not been confirmed, had been brought to Dover where they would be medically assessed. HM Coastguard, which assisted in the operation, said it was "only concerned with preservation of life, rescuing those in trouble and bringing them safely back to shore, where they will be handed over to the relevant partner emergency services or authorities".